Today’s recipe is an absolute winner in preparation & taste. It is simple, easy, quick & requires few ingredients. It is full of flavor, the aroma is heavenly & has just the right amount of spices allowing the chicken to bloom in its juices. While the chicken is roasting, the refreshing scent of lemon will be wafting from your kitchen to fill the entire house & will lift your mood to enjoy Christmas & the entire festive season. I made this before Christmas to check out the flavors so that I could include it for Christmas lunch or dinner. I love potatoes, so added it… Everyone knows potatoes taste divine with roasts! 2 tsps. Red Chilli pwd. ½ tsp. Black Pepper pwd. Mix all the ingredients mentioned above for the marinade in a small bowl. Empty the cavity of the chicken, wash & drain well. Rub in the marinade inside out. Cover with foil or cling film & place it in the fridge for a few hours or preferably overnight. Take the marinated chicken out of the fridge about 30 mins. before it goes into the oven. Mix all the ingredients mentioned above for the stuffing in a small bowl. Place the chicken on a roasting tray. Fill the chicken cavity with the prepared stuffing. Stitch up the cavity with a strong thread carefully. Insert pieces of butter below the skin of the chicken& rub some butter on top of the chicken too. Tie up the legs & wings to give a good finish & for even roasting. Pour the marinade juices on the chicken & drizzle some more olive oil on it. It is time to put the chicken in the oven for roasting. Remember the roasting time varies depending on the weight of the chicken & the type of the oven. 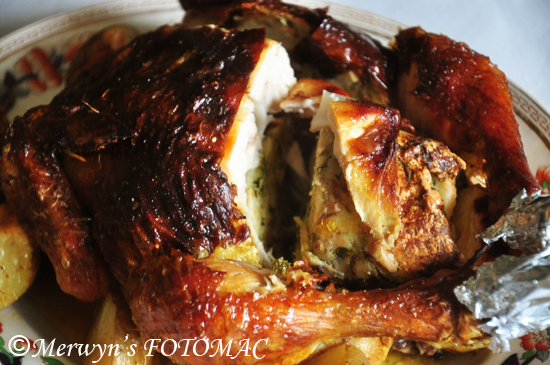 Put the roasting tray with the stuffed chicken, lime peel & potatoes into the preheated oven. Turn the heat down immediately to 180C & cook the chicken for 1 hour and 30 mins. Flip & baste the chicken halfway through cooking with the juices. Cook till the skin is golden brown. When cooked, take the tray out of the oven & let it rest for 15-20 mins. Remove the string from the chicken & take off the wings. You may add them to your gravy if you want some more flavor to it. Carefully & neatly cut down between the leg & the breast. Cut through the joint & pull the leg off. Repeat on the other side, then cut each leg between the thigh & the drumstick so you end up with four portions of meat. Carve the rest of the chicken by angling the knife along the breastbone. Carve one side off, then the other & use your fingers to pull off the rest of the bits of chicken which cannot be done with a knife. Turn the chicken over to get all the tasty, juicy bits from underneath. You should have a platter full of lovely chicken meat & only the stripped carcass should remain. 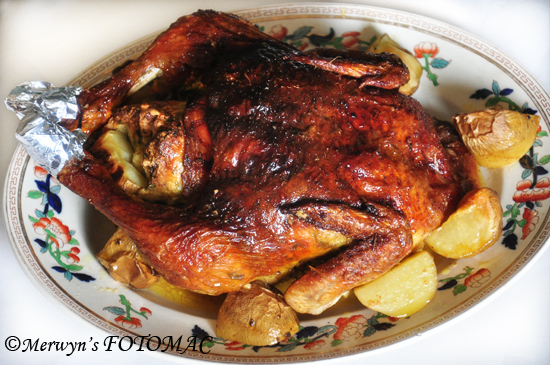 Serve your platter of roast chicken with roasted potatoes. Prepare piping hot gravy with the remaining juices from the roasting tray & serve along with the roast chicken. Should the two eggs the stuffing be boiled or raw beaten eggs. 1.I didn't get as much marination juices as I wished. I had marinated and put the chicken in the freezer and then stepped down to the fridge before roasting-was that the reason? 2.The filling seemed a little dry-maybe I can add more egg?